Other geological events, such as meteor sightings, and fireballs are minor occurrences of an unpredictable nature with no damage associated with them. Of greater impact was a sinkhole at St. David's in 1985 that collapsed a driveway. The sinkhole was about 2 m diameter and 6 to 7 m deep. Sinkholes are funnel-shaped depressions, or sinks, in the ground surface, commonly tens of metres in diameter. Reproduced by permission of Trevor Bell, © 1997. 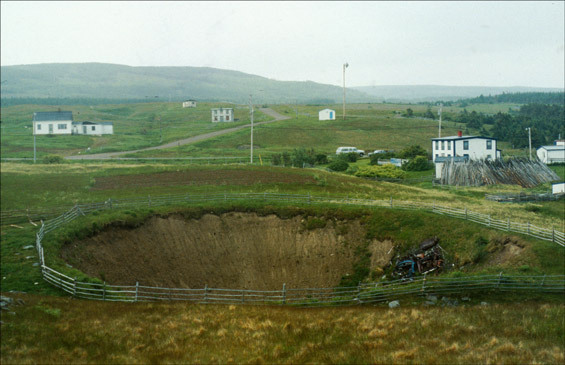 Sinkholes are a hazard on the west coast of the island, although their distribution is geologically constrained to the southern St. George's Bay and Codroy Valley areas. Incidences of other geological events in Newfoundland and Labrador are shown on the map below and in the accompanying table. Images and text reproduced by permission of M. Batterson, D.G.E. Liverman, J. Ryan and D. Taylor, The Assessment of Geological Hazards and Disasters in Newfoundland: An Update. (St. John's: Government of Newfoundland and Labrador, Department of Mines and Energy, Geological Survey, © 1999) unless otherwise noted.